As Australia’s island state, Tasmania has a long naval and maritime tradition reaching back to the earliest days of the Australian colonies. Its contribution to the naval defence of Australia has been substantial and well out of proportion to its small size. Tasmania’s first major encounter with the navy occurred in unusual fashion. Following the Rum Rebellion in Sydney in January 1808, the former Governor of New South Wales, Captain William Bligh, RN, having spent a year under house arrest in Sydney, spent another 12 months effectively under house arrest aboard HMS Porpoise anchored in the Derwent River just off Hobart. Bligh had been given command of Porpoise in January 1809 on the condition that he returned immediately to England. Instead, he sailed to Hobart where he tried to enlist the help of the Lieutenant Governor of Van Diemen’s Land, Colonel David Collins, to retake control of New South Wales. Collins refused. Bligh eventually returned to Sydney in January 1810 after Brigadier Lachlan Macquarie had been appointed NSW Governor and subsequently returned to England. Governor Macquarie visited Tasmania in 1811 and initiated its first colonial defences, issuing orders for the construction of a signal station atop Mount Nelson and a barracks in Hobart to be manned by British colonial troops. Earthworks for gun batteries around Hobart were started in 1854 but the batteries themselves were not installed and the works were allowed to fall into disrepair. Tasmania’s first volunteer unit, the Hobart Town Volunteer Artillery Company, was formed in October 1859 and set about completing the batteries. The first Royal Hobart Regatta was held in 1838 and did much to establish Tasmania’s maritime and naval heritage. The day was declared a public holiday and consisted of friendly competition between amateur sailors and members of the merchant navy. The event became a popular attraction for the ships of the Royal Navy’s Australia Station and, along with annual fleet exercises conducted in Tasmanian waters in the later years of the 19th century, helped to make Hobart one of the most popular Australian ports amongst the British sailors. A joint survey of Australian waters was undertaken in the 1850s and 1860s with the colonies sharing costs with the British Admiralty. Tasmania, however, was unable to meet its part of the costs and withdrew from the survey after just one year, Major-General Sir William Jervois making special reference to Tasmania’s largely unsurveyed waters in his report on colonial defences in 1878. Tasmania never had its own dedicated colonial naval force but it did have a naval presence throughout the 1800s firstly through the schooner Eliza, manned by British marines in the 1830s and 1840s and used to prevent convicts from escaping by boat. A torpedo boat, designated TB1, arrived in Hobart in May 1884 to be operated by the Volunteer Engineer and Torpedo Corps. The 63 foot, 12 tonne boat was a major investment for Tasmania costing some £3,300, however, it was barely seaworthy and the volunteers lacked the technical expertise required to operate it. It leaked, the concussive effects of the engine caused rivets to spring apart and its first trials were not until five months after its arrival, and then only because two engineer officers from HMS Nelson were visiting the colony. It took the better part of half a day to get the boat off its slipway and steaming. Consequently TB1 was rarely used and when it was, it remained within the confines of the Derwent River. It had fallen into complete disuse by the turn of the century and was transferred to South Australia in 1905. Seven days after the granting of the Royal Assent to the Australian Navy on 10 July 1911, Tasmania was assigned its first permanent naval presence. Captain Walton Drake, RAN, was appointed as the state’s District Naval Officer (DNO) based in Hobart, while a Sub-District Naval Officer was appointed in Launceston. A plot of land was also purchased on the western bank of the Derwent River in 1911 for the purposes of establishing a naval depot. Construction began the following year. HMAS Canberra at the Hobart Regatta, February 1934. The main responsibilities of the DNO were recruitment, training of naval reserves, assistance to visiting warships and the ‘general responsibility as far as naval interests are concerned, for the coastline within his district including the arrangements for rendering the Signal Station service efficient for naval purposes in case of war’. Within four years the importance of this last responsibility was demonstrated. On 2 August 1914, two days before the official declaration of war, the Director of Naval Reserves was ordered to establish an Examination Service at all defended ports, including Hobart. The Service was in place the following day and by 5 August, all ships were required to submit to an examination before entering harbour in order to identify and ascertain the character and intentions of the vessel. Local coastal pilots were commissioned as Lieutenants, RANR to operate the examination service while three local boats were requisitioned as examination vessels. The German-Austrian liner Oberhausen was detained at Port Huon within days of the outbreak of the war. She was subsequently renamed Booral and used as a cargo carrier for the duration of the war. Of the 109 known RAN casualties during World War I, 11 were Tasmanian, including telegraphist (and former HMAS Protector featherweight boxing champion) Cyril Baker, in the ill-fated HMA Submarine AE1. Only Victoria and New South Wales suffered a greater number of casualties. The DNO continued in its support and training role in the inter-war period. From 1924 the torpedo boat destroyers, HMA Ships Huon and Swan were based at Hobart and Launceston respectively for Naval Reserve training. 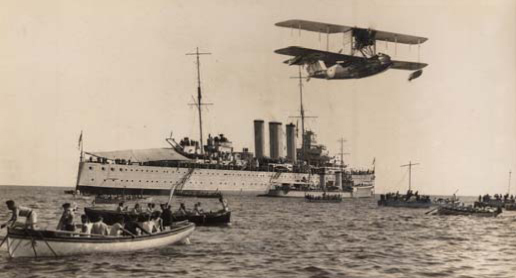 From 27 March to 3 April 1924, Hobart played host to the visiting RN Special Service Squadron on its Empire Cruise. The Squadron was commanded by Vice Admiral Sir Fredrick Field, KCB, CMG, RN, in his flagship HMS Hood accompanied by six other RN vessels and HMAS Adelaide. The cruise was a successful public relations venture for the RN, and a reminder to all that Britannia still ruled the waves. While the permanent naval presence in Tasmania was comparatively small, the RAN made its presence felt with vessels attending the Royal Hobart Regatta and with one vessel traditionally acting as flagship. The three months following the Regatta would be spent in Tasmanian waters conducting exercises to bond the ships’ crews following the summer leave and posting period. This association with the Regatta continues to this day, with only the Great Depression putting a temporary stop to naval participation. Between 30,000 and 40,000 people attend the three day event every year. HMAS Huon on the Derwent River, Hobart. The Great Depression affected the naval presence in Tasmania in other ways as well. Huon and Swan both decommissioned in 1928 and, at the turn of the decade, staff levels were gradually reduced. From April 1930, only one officer, a surgeon lieutenant commander, was posted to the Sub-District Naval Office in Launceston. The onset of World War II led to an increase in naval staff in Hobart. An examination service and Port War Signal Station were in place on 3 September 1939, and five requisitioned ships acted as examination vessels over the course of the war. The signal station was moved from Mount Nelson to Cape Direction, overlooking Storm Bay, on 20 November 1939. The naval depot in Hobart had gone without a name since its establishment nearly three decades earlier. On 27 August 1939, the depot was commissioned as HMAS Cerberus VI following the naming convention applied to other naval depots around the country. When the decision was made to abandon this convention, the depot was renamed HMAS Derwent on 1 August 1940. However, the Royal Navy had a Hunt class destroyer, HMS Derwent, also in commission so the establishment was again renamed, becoming HMAS Huon on 1 March 1942. Tasmanian shipbuilders also made their contributions to the war effort with EA Jack of Launceston and Purdon & Featherstone of Hobart each building three harbour defence motor launches for the RAN. Purdon & Featherstone built the first vessel of its type in Australia, HDML 1321, which served in enemy waters under the control of the Allied Intelligence Bureau supporting Coastwatchers in the Pacific. In April 1945 she landed eight members of the Z-Special Unit on Muschu Island in New Guinea for a reconnaissance mission; only one returned. As with the previous war, many Tasmanians made the ultimate sacrifice during WWII. At least 139 Tasmanian sailors gave their lives, including 36 aboard HMAS Sydney. Many also perished in other ships lost during the war such as Perth, Yarra, Canberra and Parramatta. Four Tasmanians were lost in HMAS Armidale including Ordinary Seaman Teddy Sheean who was born in Barrington and last seen defiantly firing his gun at enemy aircraft as Armidale slipped below the waves. Three Tasmanians were amongst the 30 officers and sailors killed aboard HMAS Australia at Leyte Gulf, including the Commanding Officer, Captain Emile Dechaineux, DSC, RAN, from Launceston, who was killed when a kamikaze struck the ship’s foremast causing an explosion and fire on the bridge. The post-war demobilisation saw Huon’s status downgraded to a care and maintenance base from 1946 until 1960. After 1960 it once again became the main support, recruitment and reserve and cadet training establishment in Tasmania. In some years, as many as ten per cent of new naval recruits came from Tasmania. The state’s training capacity was boosted in 1982 with the transfer of the Attack class patrol boat HMAS Ardent to the Hobart Port Division of the Naval Reserve. The presence of Ardent in Tasmanian waters was a common sight for the next decade averaging 100 days at sea per year. In addition to training cruises, she also conducted fishery patrols off the southern Tasmanian coast. Huon, amongst a number of other bases, decommissioned on 17 June 1994 with the office of the Naval Officer Commanding - Tasmania moving to new offices at Anglesea Barracks, a petition containing 23,000 signatures not enough to keep the establishment open. Ardent sailed from Hobart for the last time that January. Huon’s buildings have since been listed on the National Estate Register. Naval Headquarters Tasmania remains an important support and training base and continues to offer logistic services to visiting warships from Australia and abroad, as well as supporting a continuing naval presence at the Royal Hobart Regatta. ↑ Bob Nicholls, 'The Colonial Volunteers', Allen & Unwin, Sydney, 1988, pp. 25-27. ↑ John Bach, 'The Australia Station', New South Wales University Press, Kensington, 1986, p. 95. ↑ Colin Jones, 'Australian Colonial Navies', Australian War Memorial, Canberra, 1986, p. 137. ↑ Commonwealth Naval Order 18/1911. ↑ World War I Casualty List, Sea Power Centre - Australia. ↑ World War II Casualty List, Sea Power Centre - Australia.